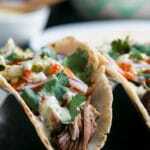 Authentic pulled pork tacos with the most juicy, tender and flavorful meat, packed into a fresh tortilla and topped with a creamy spicy salsa verde sauce to die for. Just perfect for your next Cinco de Mayo party. Sprinkle the pork with salt and pepper generously. Heat oil on med-high on the stove in an oven proof pot. Brown the pork shoulder on all sides and remove from pot. Add onions and sauté for a few minutes. Add garlic cloves, bay leaves, oregano, chili powder, and chipotle powder. Cook for a few minutes more and then add the beer, orange juice, and chicken broth. Add the pork back to the pot and make sure the liquid covers or almost covers the meat. Bring liquid to a simmer on the stove. Once its simmering, cover and put the pot into the oven. Cook for 3 hours or until the meat falls apart easily. Remove from the pot and shred with two forks. Meat should fall apart very easily. Put it in a serving bowl or container with a lid. Spoon some cooking liquid over the meat to keep it moist and flavorful. If you like, you can try to get some of the fat off the top of the liquid first. Make the salsa verde according to the recipe instructions. Add the sour cream and stir to combine. Fill one flour or corn tortilla with a good amount of pork, spoon the sauce on and eat. I like my tacos with some crunchy cabbage as well. This sauce is so good and it tastes really good on many different dishes. I love it on barbequed prawns, or fish tacos, but it would taste really good on chicken. You can also use it as a sauce for chicken enchiladas. Option: If you aren’t a fan of Salsa Verde or cilantro, as I know some of you aren’t, these taste really good with homemade salsa and some Quesco Fresco cheese or Monterey Jack. We ate them like this when we ate the leftovers and they were so dang good!